What do you do when you sue U.S. Attorney General John Ashcroft and win? Fifty-one-year-old Valerie Corral, a sinewy 5-foot tall great-granddaughter of Italian immigrants, throws back her head laughing, her hands reaching to the clouds, hips wiggling, feet stomping. "It's my happy dance!" she says, throwing her arms around her husband Mike. She has also planted an acre of marijuana. The decision that lets the crop remain is just one round in a long legal battle. Last month, a federal judge in San Jose issued a preliminary injunction banning the Justice Department, including the Drug Enforcement Administration, from interfering with the Corrals' pot garden, set above an ocean bluff near Davenport, about an hour south of San Francisco. The injunction gives the judge time to reconsider his earlier decision to allow the garden to be uprooted. Still, the Corrals call the injunction a victory. They share their harvest through the first legally recognized, nonprofit medical marijuana club in America, which they founded in 1993. The club has about 250 seriously ill members who have prescriptions from their doctors to use marijuana to alleviate their suffering, increase their appetites and control their seizures. The marijuana is free. The San Jose ruling is one of a number challenging federal restrictions on medical marijuana, which has consistently won support in national opinion polls since 1995 but has had a mixed record in state ballot measures. This summer, the U.S. Supreme Court is expected to decide whether to hear another case that could undo or affirm the Corrals' right to grow pot — granted by state and local regulations, but denied by federal law. A second case in federal court in San Francisco — in which other medicinal-use growers seek to reclaim seized marijuana — could also affect the couple. The Justice Department refused comment. For now, the Corrals are the only people in the United States growing marijuana in their backyard backed by state law, a local ordinance and a federal judge's injunction. And Valerie Corral has become a heroine to proponents of medical marijuana. "This could be the moment of the beginning of the end of this insane war against the sick," said Bruce Mirken of the Washington D.C.-based advocacy group Marijuana Policy Project. "And while the DEA and the Justice Department characterize Valerie as a common drug dealer, all you have to do is spend two minutes with her to know that's a lie." During the past three decades, while sharing marijuana with sick people, Corral has watched — and in many cases held — 140 friends, ranging in age from 7 to 96, as they died of cancer, AIDS and other illnesses. "It is the greatest honor to be asked by a person who is dying to sit with them," she said. Reflection on those deaths has given her strength, she said — while battling the government, when federal agents pointed a rifle at her head, and when her motives have been called into question. "John Ashcroft is not someone I would have chosen to tangle with, but I think of him, and George Bush, as lost souls," she said. "When I look at them, I think about how they are just people, ... and that makes them less fearsome. Ultimately we all make the same journey, and ultimately I hope they make theirs in peace." In fact, Corral's compassion is grudgingly respected at the DEA's San Francisco office. "I'm personally impressed with her desire to help deathly ill people," said spokesman Richard Meyer. "It's just that she makes it look like the way to help sick and dying people is to give them marijuana. And that's not the case. "There's hundreds of ways to help these people. The DEA has a lot of compassion for those people who are sick and dying, but I think there are many, many ways to help them without giving them marijuana." At DEA headquarters, authorities said the issue has nothing to do with Valerie Corral or compassion. "This may be personal to her, but it's not personal to the DEA," said the agency's Will Glaspy in Washington, D.C. "The DEA's job is to enforce the Controlled Substance Act. Congress passed the laws and charged us with enforcing them. She is attempting to use the court system to get what she wants." Valerie Corral's path to becoming a medical marijuana advocate began 31 years ago, the day a small airplane swooped low and buzzed a Volkswagen she was riding in through the Nevada desert. The car went out of control and was sent skidding, rolling and bouncing 365 feet through the dust, brush and rocks. Corral's slight body was flung against the roof and doors, causing brain damage, epilepsy, and a lifetime of staggering migraines. She took prescription drugs but still suffered convulsions, shaking and grand mal seizures. Then one day, Mike handed her a medical journal article that showed marijuana controlled seizures in mice. Since then, for 30 years, Valerie Corral says she has maintained a steady level of marijuana in her system. 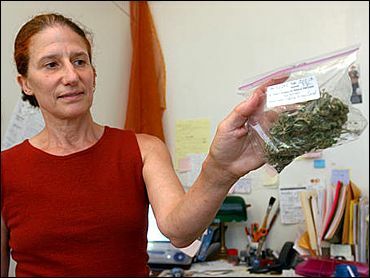 Her legal challenges began in 1992, when the local sheriff arrested her for growing five marijuana plants. With Mike, she challenged the law, using the defense of necessity. Prosecutors dismissed the case, saying they didn't think they could win before a sympathetic jury in liberal Santa Cruz. When the sheriff arrested the Corrals again in 1993, the district attorney said he had no intention of ever prosecuting them and told police to leave them alone. A few years later, the Corrals helped draft California's landmark Compassionate Use Act, approved by voters in 1996, that allows patients with a doctor's recommendation to use marijuana. Similar laws in Alaska, Arizona, Colorado, Hawaii, Maine, Nevada, Oregon and Washington allow the infirm to receive, possess, grow or smoke marijuana for medical purposes without fear of state prosecution. But the law did not provide complete protection from arrest. While local authorities worked with the Corrals to protect them against theft and coordinate distribution, federal agents continued to assert that growing, using and distributing marijuana was illegal. To provide legal protection, the city of Santa Cruz deputized the Corrals in 2000 to function as medical marijuana providers. But in September 2002, federal agents raided the Corrals' farm — just weeks before their annual harvest — taking the couple to jail and pulling up more than 150 plants. The Corrals were never charged, but the raid prompted them to begin a legal challenge to the federal ban, aided by a team of attorneys including Santa Clara University law professor Gerald Uelmen and advocates at the Drug Policy Alliance, a non-profit Washington D.C.-based organization. This is the case in which the San Jose judge recently ruled in their favor. "Representing Valerie Corral, for me, is like representing Mother Teresa," said Uelmen, a constitutional law expert, calling her "one of the most compassionate people I've ever met." And one who has led a movement to a new high.